Home › Red-naped ibis › Bar-headed goose - Anser indicus. The bar-headed goose (Anser indicus) belongs to the family, Anatidae. 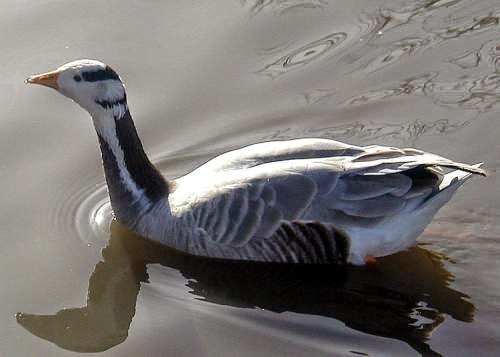 The bar-headed goose breeds in Central Asia, mainly Mongolia and China. They are migratory birds. They winter in South Asia, including Pakistan, India and Myanmar. The IUCN (International Union for Conservation of Nature) has categorized and evaluated this goose species and has listed it as of "least concern". These birds are fairly large in size, measuring 70 to 75 cm in length and weighing 2,000 to 3,000 grams. They have a wingspan of 140 to 160 cm. They are pale grey in color with whitish head with distinguishing black bars on the head. The legs of the goose are orange in color. They mainly feed on grasses, roots, stems and other plant matter. They breed during May and June. The female goose lay three to eight eggs in the ground nest. Current topic in Birds of India: Bar-headed goose - Anser indicus.